The bill would allow for a pilot program of remote monitoring at 50 locations throughout New York City, with offenders receiving fines in the mail, similar to the red-light cameras already in place. The locations have yet to be determined. 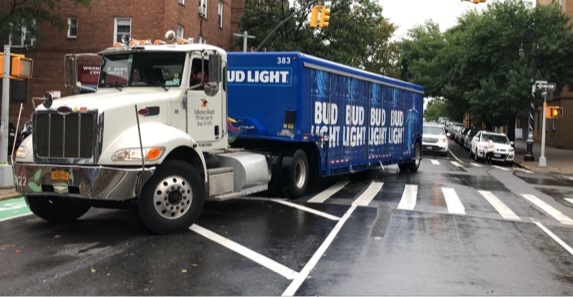 “We must protect bicycles from reckless drivers,” said Assembly Member Michael DenDekker (D-Jackson Heights), the bill’s author. DenDekker drafted the measure after Woodside cyclists complained of cars and trucks clogging the Queens Boulevard bike lane, according to a statement. Mayor de Blasio has shown strong support for the lanes throughout his tenure, and the Department of Transportation has added more than 83 miles to the system under his watch, according to 2018 figures provided by the agency’s commissioner, Polly Trottenberg. But only a fraction of those paths have physical barriers separating cyclists from drivers, and de Blasio earlier this year balked at the cost of using dedicated NYPD teams to patrol the lanes. Cops themselves are routine violators of bike-lane parking laws, critics charge. At least one Twitter account, @CopsinBikeLanes, has dedicated itself to calling out officers, in New York and elsewhere, for the practice. DenDekker praised the DOT’s commitment to building the lanes, but he says more must be done to protect the riders who use them. “We must ensure that enforcement of traffic laws keeps cars and trucks out of those bicycle lanes and allows bicyclists to travel in bicycle lanes safely,” he said. DenDekker introduced the bill, A06674, in March. It currently sits before the Assembly Transportation Committee. Heck yeah. I been hit twice already in a bike lane by cars. I do own a vehicle for work emergency and I pay for a parking spot. However I choose not to to drive unless I have to because it’s better for the environment and my community. All these people complaining about cars and no parking could do their part as well. Cyclists are allowed to move in between traffic, thats one of the pros to riding a bike, you dont have to be stuck in traffic. You don’t expect cyclists to wait behind motor vehicles like a motorist do you? I usually have to swerve in and out of traffic because motor vehicles don’t know how to properly stay in the middle of the lane, they are usually too close to one side, so most of the time I have to go around it, so you can blame motorists for that. In regards to running red lights, I wouldn’t condone it on major roadways. I usually treat red lights like stop signs, if there are no cars or pedestrians going into the intersection, I don’t see an issue with crossing the red light, most pedestrians do this too. As a fellow cyclist (been bike commuting from Queens to the city for 7 years), I have to disagree. No, you’re not allowed to weave in and out of traffic. As a cyclist you and I are subject to the same traffic safety regulations as a vehicle, not a pedestrian. It frustrates me to see so many cyclists who think they’re above following the rules. Not only do they not obey lights, but I shake my head every time I see one of us not using lights, not signaling, not equipped with a bell. We’re not invincible and it’s ridiculous how many of us act like we are.